Traditional pecan pie is old news. 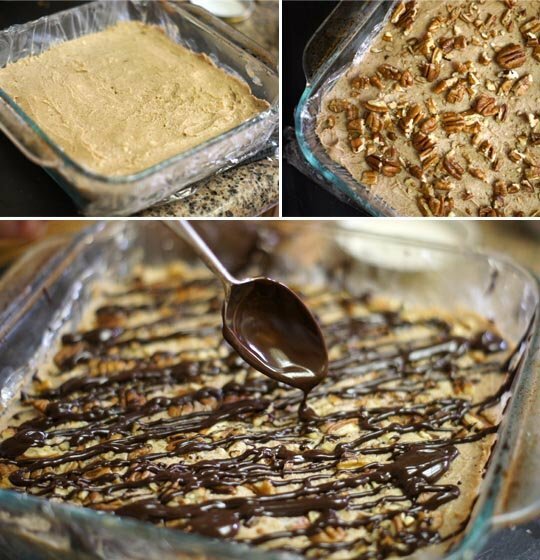 This year, we’ll be enjoying these No-Bake Pecan Pie Bars instead! With all the work involved to prepare Thanksgiving dinner, I figure we could all use a simple dessert recipe that doesn’t involve the oven, for a change. All you need to make these treats is a blender or food processor! Featuring nutrient-rich dates and buttery pecans, these bars are deceptively brimming with a variety of B vitamins, iron, and fiber, but all you will taste is the distinctive, rich flavor of pecan pie. While preparing these bars, Austin mentioned they’d be even better with drizzled dark chocolate… so, of course, I had to make that happen. Whether you decide to add the extra dark chocolate or not, I hope you and your family will enjoy this healthier alternative! Line an 8″ x 8″ baking dish with plastic wrap, for easy removal of the bars. In a large food processor, combine the crust ingredients and blend until a sticky dough is formed. Press the crust into the lined baking sheet, using your hands or a spatula to smooth it out. For dark chocolate pecan pie bars, melt 1 cup of dark chocolate chips and pour the melted chocolate over the crust, using a spatula to spread evenly. Place the crust in the freezer to set, while you prepare the filling. For the filling, combine all of the ingredients in a high-speed blender, or food processor, and blend until thoroughly combined. You may need to stop and scrape down the sides, or use a tamper, to keep everything blending smoothly. Adjust sweetness to taste, if necessary. Remove the crust from the freezer, and pour in the filling, using a spatula to smooth the top. Sprinkle the additional cup of raw pecans over the top, and gently press them into the filling for easy serving. Drizzle an additional 1/2 cup of melted dark chocolate chips over the top, if desired. Return the bars to the freezer, and allow them to set for at least 6 hours, or overnight, before cutting and serving. 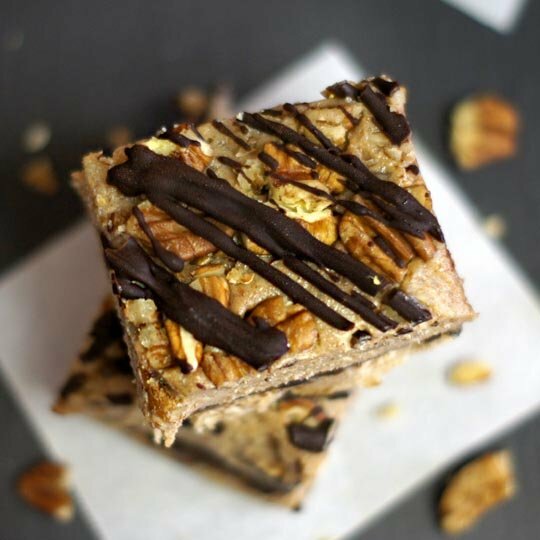 Featuring nutrient-rich dates and buttery pecans, these no-bake bars are deceptively brimming with a variety of B vitamins, iron, and fiber-- but, all you will taste is the distinctive, rich flavor of pecan pie! Line an 8" x 8" baking dish with plastic wrap, for easy removal of the bars. In a large food processor, combine the crust ingredients and blend until a sticky dough is formed. Press the crust into the lined baking sheet, using your hands or a spatula to smooth it out. *For dark chocolate pecan pie bars, melt 1 cup of dark chocolate chips and pour the melted chocolate over the crust, using a spatula to spread evenly. Do you think any type of other nut would work? I have walnuts and almonds but no pecans! How far in advance can these be made or should/can I store them in the freezer for a few days? Thanks so much! Hi Megan. I have the same question as Rikki….. Is there a substitution that would work for the coconut in the crust? I don’t particularly enjoy the taste of coconut, but would love to try these. Thanks for your help, and thanks a million for all the great recipes. I tell everyone about your site! Will you make a special for Christmas?? Recipes to give as a gift?? I’m looking for yummy homemade treats but with a healthy twist to give to my family and friends!!! Oh my, This is absolutely delicious! I will have a hard time staying on my new way of healthy eating with these in my fridge. I am glad it is all healthy. My family loves them. Thank you for your wonderful recipes! It was my husband’s birthday yesterday. Having recently moved to the U.S from India, I neither have a microwave nor the bakeware needed to make dessert. I stumbled across your website and decided to give the no bake pecan pie a shot. I made a few modifications to the recipe based on what was stocked in my kitchen- used pecan and walnuts, substituted dates with raisins and also threw in nutella instead of the dark chocolate. It tasted heavenly. It was a big hit with my hubby 🙂 Thanks for the inspiration! I intend to add your website to my “favorite” page!! I will probably make this entire menu for Christmas. Found this when trying different approaches to finding some thanksgiving-themed treats for my birthday. Thank you so much for this recipie! It is the best sweets I have ever tasted! I made these to take to Thanksgiving, and they turned out AMAZING! the dates and pecan combination is to die for! I just made these to take along to our Thanksgiving feast tomorrow. They smelled so good while I was making them I had to try one. They were amazing! Thanks for posting! Hi! I just made these tonight to have for Thanksgiving. They look & smell delicious!! I was wondering if I should keep them in the freezer until it’s time to serve, or if it’s okay to freeze them overnight and then just keep them in the fridge under Thurs night? Thanks! I stumbled across your ‘snickers bars’ & then found your pecan pie bars. Both sound like great ideas, except for 2 things: 1) How can I make them coconut free (no coconut nor coconut oil)? 2) What can i replace the dates with? Hi, I made this, and while they are very tasty, mine came out pretty ugly looking – not good enough to serve to guests. Everything was sticking to each other – it was impossible to spread the chocolate and then the filling. What am I doing wrong…? I made these when visiting my parents and we all enjoyed them very much. I’m thinking about making them for Thanksgiving this year; OR the mini pumpkin tarts. So many delicious options. Can I use date sugar instead of dates in this recipe? I have a ton of date sugar, but have not been successful using it. . . Dates add texture and moisture to this recipe, so the date sugar wouldn’t work without a lot of experimentation! I made this today. So delicious with a cuppa on this cold rainy day. The sweetness is just perfect. My new favourite slice. These look amazing! Do they need to stay in the fridge or will they be fine in the pantry? I’d recommend keeping them chilled for best shelf life. I’m so dying to try these but I do have a question about the crust before I dive in. I don’t have a food processor (unless you consider the Magic Bullet workable). I do however have the Vitamix blender (a worthwhile investment) with the regular container. Would it work in getting the sticky texture needed for the crust? If so, I don’t know which setting to use to get it to that consistency. Suggestions anyone?? I’ve never tried it in my Vitamix, but I imagine it could work, as long as you don’t over-blend it! I’d just start on low and “pulse” it to make sure it gets crumbly, rather than blended. Hope you enjoy them! Thanks for the tip. You’re awesome! This recipe just went on my “to do” list this weekend! Can’t wait! Loving them. I actually had a pecan, praline flavored maple syrup on hand and I added a bit of lemon zest to the filling. This dessert is perfection! Whoa! I made these for a party and have had tons of requests for the recipe. Thank you! I also added some vanilla and found that the 1 cup of pecans on top was too much for me, so just used the remaining melted chocolate. Finally, as rich as these are, cutting them into 16 squares & then 32 triangles was perfect! Made these a few days ago (no chocolate) and they were great! I added a splash of vanilla to the filling for a bit more flavor. I tried these with walnuts instead of pecans and they turned out amazing!!!!!! well done on the recipe! it was a big hit in my house! I made these for thanksgiving ad they were a hit!! Thanks. You are my new favorite blog! I notice you use a lot of dark chocolate. Doesn’t it contain refined sugars? Do you use a certain kind? Hi Desiree! For my chocolate recipes, I usually opt for 70% or darker chocolate, because it’s lower in sugar content than standard chocolates. For many of my visitors, upgrading to dark chocolate over semi-sweet chocolate is a huge step in the right direction. I try to buy organic dark chocolate that is sweetened with beet sugar, but I’m not sure that it makes much of a difference. The key is using it in moderation! Easy to make, and delicious! I’m going to have to take them to work like an old-fashioned sugar filled dessert as I will eat the whole pan if I keep them home. Thanks for developing this wonderful treat! Love the sound of these! Just one question, would the chocolate chips be normal ones you buy at supermarket? ie they would have sugar so I don’t know if that makes it paleo, or do you have a recipe with paleo chocolate I could use instead? I”m trying to avoid refined sugar altogether. Thanks for this. These look amazing! I have so many Paleo friends right now, always looking for something sweet to serve them. Pinning these now and into the recipe box. Looks fantastic! These are so delicious! I wanted to make them before Thanksgiving and store them in my freezer, but now I’m afraid they won’t last that long! I’m going to try these out on my family this weekend. HOW can I go wrong with pecans, coconut and maple syrup, I just don’t know. I’m also going to make the grain-free stuffing with the parsnips. Detoxinista – your recipes are an inspiration for me to continue my healthy lifestyle. Thank you SO much!!! I want to try so many of your recipes, it’s not even funny! So enticing! I just found your website and am in love already with what I see here! I have a question, I hope it’s not too intrusive!, but how much do you weigh?!? lol 🙂 Your profile pic is gorgeous and you look very thin, but most of these recipes are so high in fat and calories. I know “everything in moderation” and that good fat doesn’t make you fat if you eat a balanced diet, yadda yadda! But I am over 40 years old, work-out daily and am able to keep a size 4 ONLY by limiting the amount of fat I eat and CAREFULLY watching my sugar too (even “healthier sugars” can be a problem if too much of it daily). So, I was just so curious how you can maintain a trim figure while eating high calorie/high fat ingredients? Do you exercise like a maniac? Maybe my metabolism is just slower than yours because of my advanced age …;( I eat a ton of veggies and always include good fats, but use them VERY sparingly, much less than your recipes call for most of the time. So, while I want very much to delve in and start making everything you share, I am a bit hesitant about changing up my diet, and to start including so many nuts especially, because I work so hard at keeping my weight where it is already. Can you reassure me with any advice? I’m sure Megan will have a lot to say about this, but for the most part it’s all about calories. If you want to eat a lot of nuts and not get fat, you have to cut out some other thing to balance it. When you cut out grains, bread, junk food and beans you get a big calorie deficit that you can fill with lots of nuts, fat and chocolate. Then when you only have juice for breakfast, you get an extra calorie deficit and can eat even more later. It’s kind of awesome because you can eat these high fat sweets and still be in a calorie range where you stay skinny. Win! Hi Michelle! I do agree with Cara that it’s partly about calories– by focusing on LOTS of vegetables and cutting out grains, I have plenty of room in my days to indulge in nuts, seeds and healthy fats. I also think that weight has a lot to do with our hormones! Working out too much, eating processed foods (especially “diet” foods), under-eating, and stress can all affect our weight, despite our best efforts at calorie-counting. If it was just about calories in vs. calories out, we’d have a planet full of super-models! The human body is much more complicated than that. When I lost the majority of my “freshman 15” college weight, I was actually eating closer to 1800-2000 calories a day– much more than I was eating while calorie-counting in college! Go figure. Other than walking my dog daily, I try to workout maybe 3-4 times a week for 30 minutes. Nothing crazy! Gaining weight has nothing to do with eating grains or working out to much. It is important that you consume whole plant based foods (which does not include oil). I teach whole plant based food nutrition, and it is not about how much you eat but what you are consuming. Also, I am an avid athlete and I eat whole grains all the time. I also workout 6 days a week including running 4-6 miles a day. I would not consider myself to be gaining weight but gaining endurance and health. Thanks for your thoughts. This is irrelevant to those delicious looking bars above, but Trader Joe’s has raised their prices on all raw almond butters! Such a smart move on their part, since their inventory goes so fast. But a sad day for me 🙁 and you! That is sad! I hope they haven’t raised the prices on their raw organic almonds– I’ve been making my own almond butter using those! That definitely seems to be the cheaper option now! Holy yum! 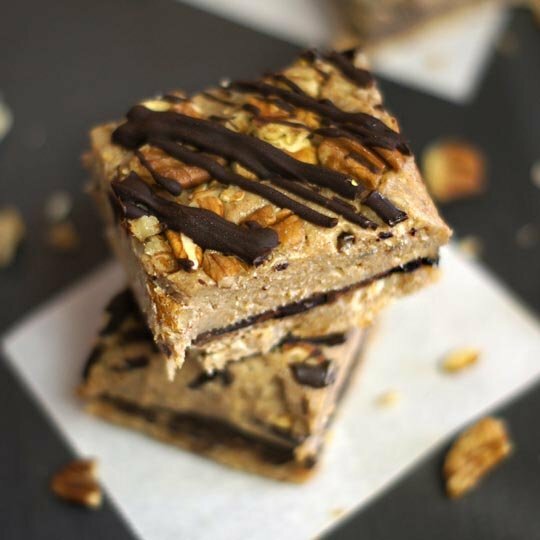 I was planning on bringing your Grain Free Pumpkin Bars with Maple Pecan Glaze to Thanksgiving but now you have me re-thinking that with these No Bake Pecan Bars. Thanks for all the options!!! Love these bars! They sound so amazing and I love that they are Paleo too! Your pictures always come out so perfect too! Makes me want to try everything even more! Wow, these look delicious and I bet would be a real crowd pleaser!